I think I’m safe in assuming that when it comes to leg-shaving, most of the women reading this article are long-time users of disposable razors. Those Venus disposables do a fine job, but they always get slimy in the shower and the heads cost a lot of money to replace. On top of that, they are horrible for the environment and will spend the next few centuries heaped in a landfill or floating in the ocean. But is there a better option? It seems like everyday Gillette and others are launching fancy new men’s razors that have more blades, oscillating heads and whatever else their engineers have cooked up. But women’s razors are mostly unchanged and, frankly, pretty lame. Well, completely by accident, I found a far better solution and it doesn’t involve a new-fangled razor with 17 blades and sonic pulses, or whatever. It’s old. Very old. 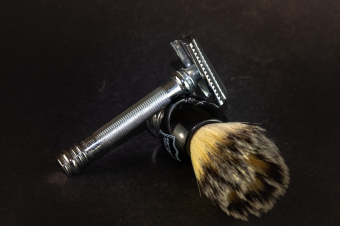 A few years ago, my husband ditched his Gillette for the kind of old-fashioned, single-blade safety razor that your Great Grandpa probably used during the Great War. I never gave using it myself much thought until I forgot mine in my mother's shower after a visit. So what do I do? Buy a replacement Venus? There on the bathroom counter is this shiny relic of men’s shaving as a real option. I decided to give it a go and had, much to my surprise, a great shave, and no cuts! I’m a convert! Built to last — Your plastic razor handle is good for a few years at most before the grip starts to peel and it looks, frankly, pretty revolting. The single-blade safety razors are built of stainless steel and made to last a lifetime. There is a very good reason old men use them — they’ve never had to replace them! Environmentally friendly — Merkur’s razor blades are made of recyclable stainless steel which means, unlike your Gillette heads, they aren’t filling a landfill. Safe — It’s called a safety razor for a reason. You would have to work pretty hard to mess up using one of these. The cool factor — The men can pretend all they want, but a huge reason these razors sell so well is that they look amazing. So shiny! So chrome! A worth-while investment — At Savon Du Bois, we sell Merkur (German-made) safety razors for between $50 and $90. That might make it seem like a bit of a luxury item, but consider this: a ten-pack of blades for it retail at $11, and last about as long as your Gillette razors‚ an eight-pack of which usually retails for $40. The biggest complaint about modern razors is how expensive the replacement heads are. Well, here’s the alternative. With blades this cheap, you will make up the cost of the handle in no time. So, ladies, stop suffering through those ridiculous and expensive ‘women’s razors’ and do both your legs and wallet a favour. Switch to a Merkur double-sided safety razor and finally enjoy shaving your legs. Visit our store to purchase your new razor!